In Far Cry 4 players will see Shangri-La. That mystical, magical paradise first described in James Hilton's Lost Horizon pops up in the form of a dream sequence. Here the player controls a Kyrat warrior, gliding through this beautiful vista armed with a bow and accompanied by a tiger. The warrior is here to eradicate the presence of demons by finding and ringing the Bell of Enlightenment. While the description of all this sounds surreal, the experience of playing it doubly so. As the player stalks the landscape filled with golden reeds and rivers of blood, they're armed with a bow that can slow down time, affording them a window to draw a bead on enemies, and they can command their pet tiger to maul attackers to death. The whole affair takes on a positively psychedelic aura, mirroring the theme of madness so prevalent in Far Cry 3. This makes sense; the unhinged nature of Far Cry 4's predecessor was partially responsible for helping turn Far Cry into a marquee FPS series. Far Cry games had always been enjoyable before Far Cry 3 came along, but it was 2012's entry that gave the franchise a sense of identity. As the game's protagonist stacked up a pile of corpses, the game's narrative touched on the idea that becoming capably violent in a hostile environment, while useful, comes with a cost to one's sanity. From its E3 reveal Far Cry 4 seems to be willing to pick up this premise and run with it. The game's villain, Pagan Min, looked flamboyantly insane in the trailer and from his exchanges with the protagonist, it's clear that he's itching to ignite a bloodbath and that he thinks the player is on the same page. There will be blood in Far Cry 4, as evidence by the scenes in Shangri-La and also by another level set in a mountaintop fortress in which the player is tasked with taking out the leader of a militia group. Since they've also been requested to 'send a message' by a disembodied voice over the radio, the group's leader has to be dispatched with a knife. The level is essentially a kill box in which players have an array of approaches. They can approach stealthily and take out the soldiers silently with a crossbow and a silenced pistol. They can use slabs of meat in their inventory to attract local predators that'll then attack the soldiers, clearing a path for them to their target. And if they prefer the direct approach they can simply haul out a machinegun and go loud. 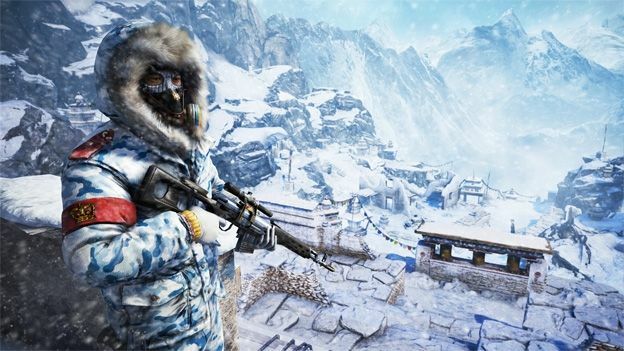 If mirrored in other levels, Far Cry 4 will accommodate pretty much any approach. Far Cry 4, then, looks to be an intoxicating power trip - much like its predecessor. It promises vast expanses to explore, visceral shooter action and one or two head trips. We don't know much about the plot beyond what we've gleaned from the trailer, but then, half the fun of Far Cry 3 was about exploring its zany narrative. You wouldn't want its sequel ruined before time, would you?